Newbie to site and after some guppy help! Hello I've just found this site after searching for some advice. I have a relatively new tank (about 8 weeks old) I have two plecs a baby kribensis, 3 baby guppies and I did have 5 male adults. I ave just lost two adults, I am pretty sure that one guppy in particular has killed them, he seems to pick one and chase them about the tank ten the guppy dies!! Any idea why this behaviour has started a they've lived together quite happy for 4 weeks. I am planning on returning the guppy as I can't brin myself to kill him!! Th other question I want to ask as silly as it sounds is if it's normal for the guppy to 'sleep' either on the bottom of te tank or floating at the top? This is my first tank so not fully clued up on fish behaviour lol!! Welcome to the forums! Glad you joined. I would definitely take back the bully guppy. Fish are individuals and sometimes a member of a normally peaceful species can be a jerk. Don't kill him! Most chain stores will take fish in a adoptions and so will most lfs (local fish store). Just curious, ado you know how big plecos get? Hey guys thanks for the advice. O have a about a 25 gallon tank. the plecs are small and the aquarium said they wouldn't grow any bigger which is why they gave me the type they did (I can't remember what type they were!) my kribensis came from a tank with guppies and they get on well. Bully fish will be going back today hopefully my last two will still be alive when I finish work and I'll get them some new friends! They are currently about 4cm I think the lady said they were leopard something or other sorry can't be of much more use. Maybe ill see some more when I go back with the bully fish later!! Hi! and welcome to the site, from another newbie. I also have a pleco that my daughter bought about 3 years ago, who wasn't supposed to get very big, but who is now about 8 to 10" long. I also don't know what type of pleco he is, and we are in love with him, so don't want to rehome him. I am planning a much, MUCH bigger tank, like 75G, just to be able to keep him comfortably. 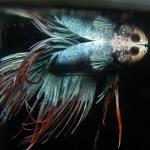 You cannot trust salespeople at fish or pet stores to give accurate information. I suggest that you try to find out, soon, what type he is, so you will KNOW how big a tank you need to keep him, or rehome him before you fall in love with him. Keep coming back here, though, cause these people have lots of great advise for those of us just starting out with fishkeeping.